Great checking accounts with KEMBA! Looking for a checking account? KEMBA has the account to fit your needs. You’ll enjoy all the tools and accessibility we offer, such as MyBranch online banking, MyMobile smart phone app with mobile deposit, overdraft protection, access to our free MyMoney personal financial manager and a Visa® Debit Card! Enjoy convenient access to over 60,000 free ATMs! Our Premium Checking account allows you to earn a premium rate* on balances up to $5,000. Use our convenient services every month to qualify for dividend earnings. Call us at 317-351-5235 or 1-800-366-0013, or stop by to switch your basic checking to premium! 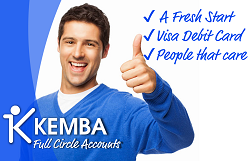 *To earn the premium rate during the statement cycle, you must complete 8 signature based debit card purchased with your KEMBA VISA Debit Card; receive your statement electronically; log in to MyBranch online banking and pay 2 or more bills online; and have one or more direct deposits into your account. If all account requirements are not met during the statement cycle, the rate will be 0.00% Annual Percentage Yield for that statement cycle. Statement cycle begins on the first calendar day of the month and ends on the last calendar day of the month. Please check the current truth in savings disclosure for current rate. There is a limit of 1 (one) Premium Checking account per household. Any balance exceeding $5,000 is not eligible for dividend earnings. Our teen checking will help you get the 13-17 year old in your life started off on the Right Foot! Let us help you help them get started on their financial future! A parent or guardian must be a joint owner on the account too. This account allows our teen members to have a Visa® Debit Card, MyBranch online banking and our MyMobile smart phone app. If you’ve had mistakes in the past with other institutions, we may be able to help you start fresh with a Full Circle Checking or Savings Account. These accounts offer you a second chance at having a relationship with a financial institution because we understand things happen. We are here to help you get back on track. Speak to a KEMBA representative for complete details about this account!